Thrombotic microangiopathy (TMA) is a term that was coined in 1952 to describe postmortem findings of disseminated thrombosis of small blood vessels. The pathological process of microvascular occlusion, thrombocytopenia, and microangiopathic hemolytic anemia  presents with primary and secondary diseases such as atypical hemolytic uremic syndrome (aHUS) and thrombotic thrombocytopenic purpura. aHUS is a rare, progressive, and often life-threatening disease that presents at any age with the triad of HUS, namely hemolysis, thrombocytopenia, and renal dysfunction. About 60% of cases are caused by uncontrolled activation of the alternate complement pathway, leading to the formation of membrane attack complex that causes endothelial cell injury and systemic TMA. Apart from HUS, extrarenal features may follow neurological, cardiovascular, pulmonary, or gastrointestinal organ injury.,,, Presentation of aHUS with microangiopathic hemolytic anemia and acute kidney injury (AKI) without thrombocytopenia, termed partial HUS, is uncommon. Kidney biopsy and/or genetic testing for the underlying defects in complement pathway enables the correct diagnosis. Lack of awareness of this association may cause confusion in diagnosis that delays specific therapy and reduces survival. The outcome for patients with aHUS has changed considerably following the use of eculizumab, a humanized monoclonal antibody that binds to and blocks the cleavage of complement C5 to C5a and C5b, thus inhibiting the formation of the terminal complement complex, C5b-9. Before the availability of eculizumab, more than half of the patients with aHUS would die, become dialysis dependent, or develop permanent kidney damage within a year of diagnosis. Early initiation of therapy with eculizumab is associated with significant and sustained renal recovery in patients with aHUS. However, it is unclear whether kidney function can be salvaged if therapy is delayed. 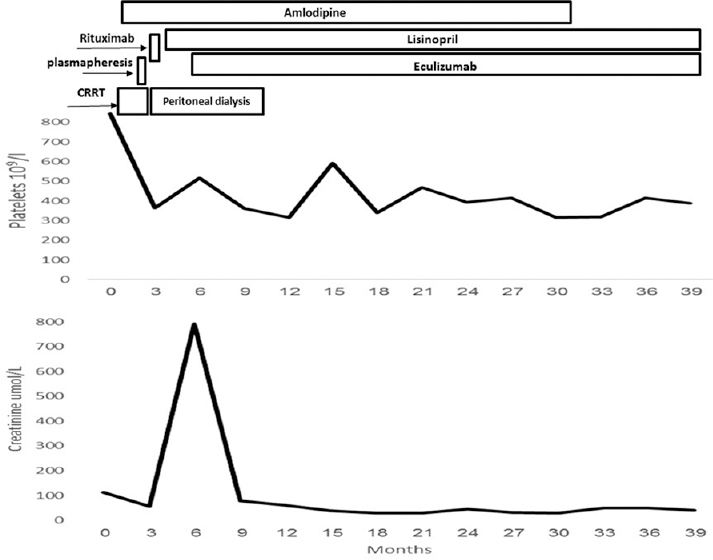 We present here the case of a young child in whom the diagnosis of partial aHUS was considered late after presentation with severe AKI, and in whom complete and sustained renal recovery was observed despite several months of delay in therapy with eculizumab. An 18-month-old boy presented with vomiting, decreased urine output, respiratory distress and generalized edema, preceded by upper respiratory tract infection. The baby was born of nonconsanguineous marriage by vaginal delivery at term and had required valvuloplasty to correct pulmonary stenosis. For the current illness, he was admitted to the intensive care unit at a hospital for 18 days, during which he underwent mechanical ventilation for cardiorespiratory failure for 2 days and required amlodipine, captopril and intermittent intravenous (IV) hydralazine for hypertension. Blood investigations had shown urea of 35.2 mmol/L, creatinine of 192 μmol/L, alanine aminotransferase of 379 U/l and albumin of 19 g/L, while urine had 2 + proteinuria by dipstick. Upon transfer to our center, blood pressure was 125/75 mm Hg (>99th percentile) and urine output was 0.4 ml/kg/hr. Investigations revealed blood urea of 28.5 mmol/L, creatinine of 136 μmol/L, bicarbonate of 15.5 mmol/L, sodium of 138 mmol/L, potassium of 5.9 mmol/L, lactate dehydrogenase of 472 U/L, hemoglobin of 10.5 g/dL, and platelet count of 813 × 109/L. The corrected reticulocyte percentage was 4.6% and there were a few schistocytes on peripheral blood film. Urinalysis showed 36 red blood cells per high-power field, with proteinuria (spot urine protein-to-creatinine ratio of 0.2 g/mmol and 24-h urine protein of 0.7 g/day). He received bicarbonate and sodium polystyrene to correct electrolyte disturbances. Furosemide administration improved the urine output to 1.4 ml/kg/hr. Hypertension was managed with amlodipine, intermittent IV hydralazine and, later, oral minoxidil. Complement levels, available later, showed low C3 (0.6 g/L) and normal C4 (0.25 g/L); antinuclear antibody was negative. Kidney biopsy was unsuccessful as the renal poles were poorly visualized on ultrasound. At discharge, the urine output was normal, blood pressure was controlled on minoxidil and amlodipine, and serum creatinine was 66 μmol/L; kidney biopsy was planned during follow up. The boy returned after 5 days with edema, oliguria, hematuria, and hypertension. Blood investigations revealed creatinine of 77 μmol/L, hemoglobin of 9 g/dL, and platelets of 450 × 109/L. Antineutrophil cytoplasmic antibody (ANCA) was negative for antimyeloperoxidase antibody (5.2 IU/mL), but antiproteinase 3 was 60.5 IU/mL (normal range: 0–20 IU/mL); there were no anti-glomerular basement membrane antibodies and activity of a disintegrin and metalloproteinase with a thrombospondin type 1 motif, member 13 (ADAMTS13) was normal (>100%). 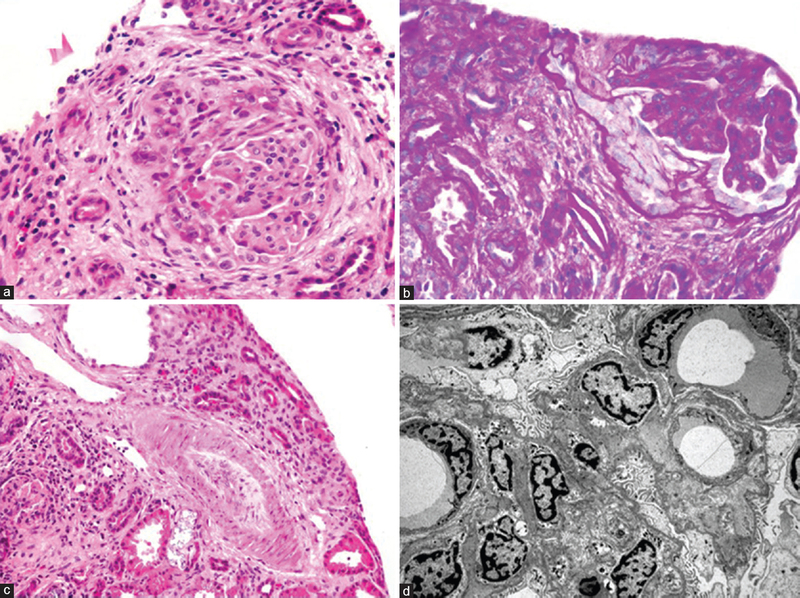 Kidney biopsy suggested proliferative glomerulonephritis with occlusion of most arterioles without obvious thrombosis, suggesting microangiopathy; and tubular atrophy and fibrosis in 15%–20% of cortex [Figure 1]. Considering the histopathological findings of proliferative glomerulonephritis, three IV pulses of methylprednisolone were administered. However, there was no response and the child developed massive pericardial effusion requiring pericardiocentesis. Dialytic support included continuous renal replacement therapy, followed by intermittent hemodialysis, and, finally, automated peritoneal dialysis. In view of ANCA positivity and worsening renal function, plasmapheresis was administered for 5 sessions daily and 5 sessions on alternate days, along with two IV doses of rituximab. ANCA became undetectable and blood pressure was controlled; however, dialysis dependence persisted. While therapy with eculizumab was planned, the drug could not be procured immediately. Kidney biopsy, repeated to assess the chronicity of renal injury prior to starting eculizumab, was consistent with chronic TMA associated with tubular atrophy and interstitial fibrosis involving 20–25% of the cortex. Immunofluorescence showed focal and segmental staining with IgG (2+) and C3 (2+). The first dose of eculizumab was given to the patient after 5 months of dialysis, two weeks after a dose of tetravalent meningococcal conjugate vaccine. The urine output increased within 2 weeks and renal function began to improve [Figure 2]. Maintenance therapy with eculizumab was continued with doses given every 2 weeks. Five months after initiating eculizumab, peritoneal dialysis could be discontinued. At the last follow-up, 33 months after initiating therapy with eculizumab, serum creatinine was 40 μmol/L with estimated glomerular filtration rate (eGFR) of 105 mL/min/1.73 m 2; there was no proteinuria and hypertension was well controlled with lisinopril alone. Kidneys appeared normal on ultrasound and echocardiography showed normal ventricular systolic function. aHUS is a rare disease that usually follows chronic uncontrolled activation of complement pathway. Incomplete forms, lacking thrombocytopenia (15%), anemia (6%) or renal dysfunction (17%), are reported., aHUS without thrombocytopenia, termed partial HUS, is not uncommon in children and may be associated with an unfavorable renal outcome. Thrombocytopenia was lacking in 40–44% of patients in two case series of HUS or TTP, one with a high proportion of secondary TMA  and another reporting biopsy-proven TMA. Similarly, prospective cohorts from Marseilles (n = 43) and France (n = 107) reported partial HUS in 12–18% of episodes in 13–14% of patients during follow up., Similarly, our patient had normal platelet count throughout his illness, despite biopsy evidence of TMA, indicating partial HUS. Normalization of platelet count is not a reliable marker of improvement in aHUS. As indicated in our patient, TMA may persist despite resolution of hematological activity; improvement of vascular lesions is indicated by improved renal function, hypertension, or other organ functions. The Marseille database and the French cohort reported similar renal outcome for patients with normal platelet counts and those presenting with thrombocytopenia., On the contrary, the renal outcome for patients with normal platelet count was reported to be worse than that in the thrombocytopenic group in a retrospective single-center study and was attributed to delayed diagnosis. Despite delayed diagnosis, our patient, who was dialysis dependent, showed complete renal recovery following therapy with eculizumab. In contrast, some reports indicate encouraging outcomes despite delay in the use of eculizumab. Initiation of eculizumab after 6 months of dialysis significantly improved cardiac function in an 18-month-old child with aHUS and enabled eGFR to increase to 70 mL/min/1.73 m 2. A 7-month-old girl with aHUS and CFH mutation could go off dialysis following delayed eculizumab therapy; however, renal recovery was incomplete and eGFR was 42 mL/min/1.73 m 2 at 18 months of age. Following eculizumab therapy on day 55 of diagnosis in a 4-month-old child with idiopathic aHUS, peritoneal dialysis could be discontinued and hypertension was controlled. Dialysis could be discontinued despite 5-month delay in therapy in our patient, the longest reported duration of dialysis preceding therapy with eculizumab. Further, unlike previous reports, renal recovery in our patient was complete and not partial. Thrombocytopenia is not essential at the presentation of aHUS and the diagnosis should be ascertained by renal biopsy and/or genetic studies. Normal platelet count is not always associated with unfavorable renal outcome. Every effort should be made to procure eculizumab because therapy, even if considerably delayed, may enable cessation of dialysis, with renal recovery, improved quality of life and enhanced patient survival. The authors would like to thank Academic and Training Affairs in King Fahad Medical City. Symmers WS. Thrombotic microangiopathic haemolytic anaemia (thrombotic microangiopathy). Br Med J 1952;2:897-903. Barbour T, Johnson S, Cohney S, Hughes P. Thrombotic microangiopathy and associated renal disorders. Nephrol Dial Transplant 2012;27:2673-85. Kaplan BS, Meyers KE, Schulman SL. The pathogenesis and treatment of hemolytic uremic syndrome. J Am Soc Nephrol 1998;9:1126-33. Loirat C, Fakhouri F, Ariceta G, Besbas N, Bitzan M, Bjerre A, et al. An international consensus approach to the management of atypical hemolytic uremic syndrome in children. Pediatr Nephrol 2016;31:15-39. Campistol JM, Arias M, Ariceta G, Blasco M, Espinosa M, Grinyó JM, et al. An update for atypical haemolytic uraemic syndrome: Diagnosis and treatment. A consensus document. Nefrologia 2013;33:27-45. Fremeaux-Bacchi V, Fakhouri F, Garnier A, Bienaimé F, Dragon-Durey MA, Ngo S, et al. Genetics and outcome of atypical hemolytic uremic syndrome: A nationwide French series comparing children and adults. Clin J Am Soc Nephrol 2013;8:554-62. Licht C, Greenbaum LA, Muus P, Babu S, Bedrosian CL, Cohen DJ, et al. Efficacy and safety of eculizumab in atypical hemolytic uremic syndrome from 2-year extensions of phase 2 studies. Kidney Int 2015;87:1061-73. Sallée M, Ismail K, Fakhouri F, Vacher-Coponat H, Moussi-Francés J, Frémaux-Bacchi V, et al. Thrombocytopenia is not mandatory to diagnose haemolytic and uremic syndrome. BMC Nephrol 2013;14:3. Bienaime F, Dragon-Durey MA, Regnier CH, Nilsson SC, Kwan WH, Blouin J, et al. Mutations in components of complement influence the outcome of factor I-associated atypical hemolytic uremic syndrome. Kidney Int 2010;77:339-49. Feng S, Eyler SJ, Zhang Y, Maga T, Nester CM, Kroll MH, et al. Partial ADAMTS13 deficiency in atypical hemolytic uremic syndrome. Blood 2013;122:1487-93. Marinozzi MC, Vergoz L, Rybkine T, Ngo S, Bettoni S, Pashov A, et al. Complement factor B mutations in atypical hemolytic uremic syndrome-disease-relevant or benign? J Am Soc Nephrol 2014;25:2053-65. Sellier-Leclerc AL, Fremeaux-Bacchi V, Dragon-Durey MA, Macher MA, Niaudet P, Guest G, et al. Differential impact of complement mutations on clinical characteristics in atypical hemolytic uremic syndrome. J Am Soc Nephrol 2007;18:2392-400. Veyradier A, Obert B, Houllier A, Meyer D, Girma JP. Specific von Willebrand factor-cleaving protease in thrombotic microangiopathies: A study of 111 cases. Blood 2001;98:1765-72. De Serres SA, Isenring P. Athrombocytopenic thrombotic microangiopathy, a condition that could be overlooked based on current diagnostic criteria. Nephrol Dial Transplant 2009;24:1048-50. Dorresteijn EM, van de Kar NC, Cransberg K. Eculizumab as rescue therapy for atypical hemolytic uremic syndrome with normal platelet count. Pediatr Nephrol 2012;27:1193-5. Nester CM, Thomas CP. Atypical hemolytic uremic syndrome: What is it, how is it diagnosed, and how is it treated? Hematology Am Soc Hematol Educ Program 2012;2012:617-25. Zuber J, Fakhouri F, Roumenina LT, Loirat C, Frémeaux-Bacchi V; French Study Group for aHUS/C3G, et al. Use of eculizumab for atypical haemolytic uraemic syndrome and C3 glomerulopathies. Nat Rev Nephrol 2012;8:643-57. Legendre CM, Licht C, Muus P, Greenbaum LA, Babu S, Bedrosian C, et al. Terminal complement inhibitor eculizumab in atypical hemolytic-uremic syndrome. N Engl J Med 2013;368:2169-81. Walle JV, Delmas Y, Ardissino G, Wang J, Kincaid JF, Haller H, et al. Improved renal recovery in patients with atypical hemolytic uremic syndrome following rapid initiation of eculizumab treatment. J Nephrol 2017;30:127-34. Emirova K, Volokhina E, Tolstova E, van den Heuvel B. Recovery of renal function after long-term dialysis and resolution of cardiomyopathy in a patient with aHUS receiving eculizumab. BMJ Case Rep 2016;2016. pii: bcr2015213928. Kim JJ, Waller SC, Reid CJ. Eculizumab in atypical haemolytic-uraemic syndrome allows cessation of plasma exchange and dialysis. Clin Kidney J 2012;5:34-6. Ohta T, Urayama K, Tada Y, Furue T, Imai S, Matsubara K, et al. Eculizumab in the treatment of atypical hemolytic uremic syndrome in an infant leads to cessation of peritoneal dialysis and improvement of severe hypertension. Pediatr Nephrol 2015;30:603-8.